KILLER sits on the couch, licking his paw. He gets some fur stuck in his mouth and struggles with it for a moment before moving on to the other paw. Killer continues licking himself, ignoring Dave. DAVE continues saying “Killer” over and over and over again. Killer mews – annoyed – and gets down from his perch. 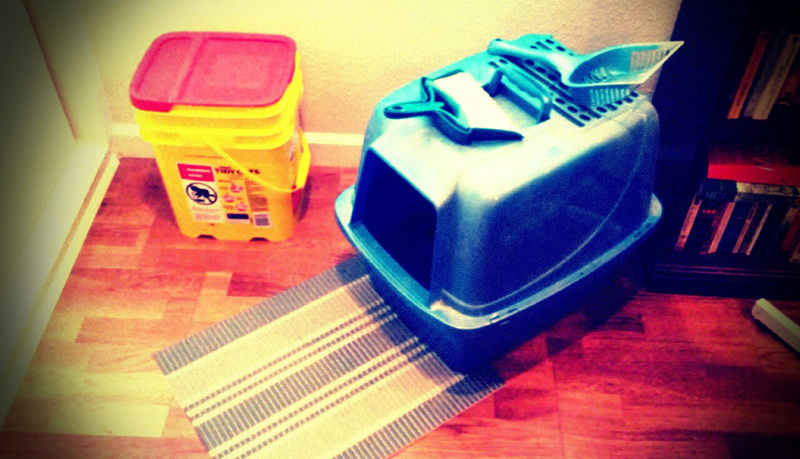 ...the office, where the litter box sits. Dave pops his head out of the litter box. Oh, you’re right there! Sweet. CHECK THIS OUT! Dave vanishes back into the litter box. All goes quiet. Nothing happens for at least 5 to 10 seconds. Killer mews and moves over to the litter box. SUDDENLY a monsoon of cat litter shoots out. Killer hops back. Dave pops his head out of the litter box once more. Isn’t it great?! I just kick with my back legs and OUT IT GOES! It will TOTALLY piss off Jonathan! Killer scuttles away, leaving Dave to his devices. He pops back into the litter box. Waves upon waves of cat litter shoot out. And everyone lived happily ever after, except Jonathan.